London! King of Cities! Prince of Capitals! Arch-Duke of Ancient Metropolitan Settlements Dating Back To At Least Roman Times! Represented a thousand times on the big screen, we picked some films that really give a flavour of the place. I’m not sure I could sit through Truly Madly Deeply these day. All that early 90s earnestness and art-house whimsy. The singing. The hopping. And let’s be honest, it’s not really a London film in any interesting or meaningful sense. It’s just set in London because most British films are set in London, unless they have a reason not to be. There’s a bit on a Routemaster, a walk on Hampstead Heath, coffee at Kenwood House, that hopping scene on the South Bank (in my view a precursor to the David Cassidy scene in Four Weddings) and Juliet Stevenson walking home from Highgate tube right at the start, but that’s about all the London we get. So why I am writing about it here? Well, I think it’s the effect it had on my provincial teenage self. Leaving aside the story of grief and ghosts for one moment, it sold me on a vision of grown-up life in London that I’m still not quite able to shake off. Catch us at the right time, or in the right mood, and films have enormous power to mould our perceptions and prejudices. Truly Madly Deeply showed me a London populated by liberal-leftish people who play Bach on dusty pianos in handsome, if draughty, sash-windowed flats with stripped wooden floorboards and tasteful rugs. They have worthy and fulfilling jobs as translators and psychologists and quirky, sexually available foreign friends. They watch Woody Allen and Werner Herzog movies, are passionate about politics and read each other Spanish poems. Just being a fan of this film in 1992 was enough to endow me with a sophistication and maturity that raised me above my peers. Watching Truly Madly Deeply over and over on a tape I taped off the telly, I knew I wanted that London life. And while I’ve lived in the big city for almost 20 years now, part of me still wants it. It’s on the Middle Line. You know, the chartreuse one. This isn’t the bold, swaggering, swinging 1960s London of Blow-Up , and it’s not the bleak, desolate world of Cathy Come Home. It’s somewhere else, somewhere less striking; a London of dun skies and delays on the Tube, of closed museums and hushed ministerial offices, of houses no-one can be bothered to demolish and shops no-one can afford to gentrify. Into this oddly familiar world comes a mystery. At first it’s fairly mundane – some skeletal remains dug up by workers digging a new Central Line extension from the wonderfully-realised Hobb’s End station, nothing too unusual for London. A metal pipe that could be an unexploded bomb brings in the Army, and the possibility of it being an unknown type of rocket from the war means Professor Quatermass comes with them. You could be forgiven for thinking this is a sedate film. For the first hour or more, the worst that happens is a bit of unpleasant feedback from a drill. The clues are set up gently. Ghosts. The rich history of London street names. When the core concept is unveiled – that human evolution was prodded along by alien locust Nazis in order to create a genetically pure colony away from their dying homeworld of Mars – it should feel ridiculous, but it doesn’t. From there, the menace builds almost imperceptibly until it is literally a howling wind of madness. When a giant, demonic Martian locust swirls, ghostly, above the rooftops of a London tearing itself apart it feels right. That the story works at all is testament to the amazing group of people who created it – Nigel Kneale’s writing walks you every step of the way, but without Roy Ward Baker bringing the same steady eye for everyday detail he brought to A Night To Remember it might still have fallen flat. The cast sell it, too – Andrew Keir is the right mix of authority and wonder as Quatermass, Barbara Shelley’s, um, Barbara Judd is no pushover even as the alien malevolence takes hold of her receptive mind, and Julian Glover has a magnificent time keeping uptight Colonel Breen exactly the right side of parody. The involvement of the military is crucial, of course. When Kneale wrote the original series, the devastation of the War wasn’t far from anyone’s mind. When the credits roll over images of Quatermass and Judd, shell-shocked in the ruined streets of London, it’s clear that it hasn’t gone far, even 20 years later. If you have seen Bridget Jones Diary (and if you haven’t look away now, spoilers are coming), you know how the film ends: an epic run through the snow covered streets of London by Bridget, in her underwear, as she attempts to clear up any misunderstanding that her past diary entries may have caused. 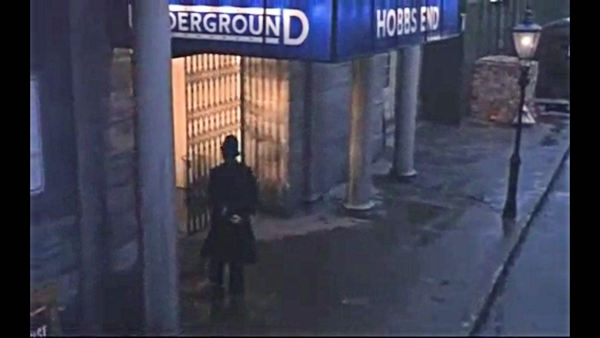 I say epic because as a Londoner I can appreciate quite how far she managed to run before she caught up with him. You see Bridget’s flat is located in Borough market, at London Bridge. It is above the Globe pub in fact (should you wish to visit). The Filofax store, where she catches up with Darcy, is located in the Royal Exchange building in the City. That’s just shy of a mile away and across London Bridge. A mile you say, why that’s nothing! But dost you forget that all she is wearing is a scraggy cardigan, undies and a pair of trainers? In the snow a London Bridge crossing would be pretty parky. Plus, well Bridget isn’t known for being the fittest of fiddles is she. Of course this is movie London, so not so much a 4 minute mile, as it is a short speedy jog round the corner. There’s also suspiciously little traffic and just two old ladies. I know the City well, traffic is plentiful (except on Christmas day) and little old ladies scarce. If you are curious, and are visiting London, the walk from Borough Market to the Royal Exchange is a particularly nice one. Take a peek at Bridget’s front door by the Globe Pub between munching samples from the local gourmet food sellers at the market. Then why not buy a Monmouth coffee to sip from as you leisurely stroll across the bridge. I recommend stopping half way across and soaking up the view, it is a fantastic view. To your right Tower Bridge, to your left St Paul’s, it’s one of the worlds best (although the view from Waterloo Bridge beats it). Enjoy the City, eerily quiet at weekends, a hive of suit clad activity on weekdays, and make your way to the Royal Exchange for a glass of something bubbly or a cocktail. Really it is one of the most beautiful bars in London. Not that Bridget and Darcy went to the bar; they were far too busy checking out Filofaxes and each other.